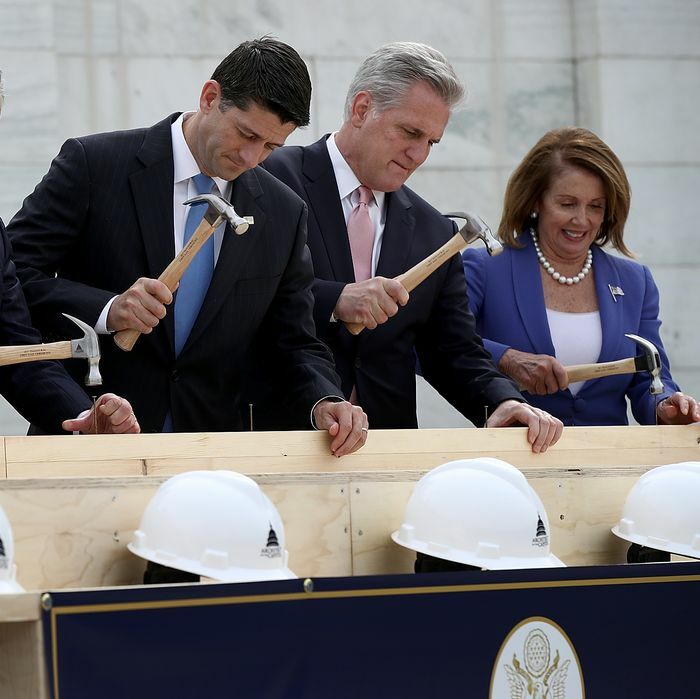 Senate Majority Leader Mitch McConnell, Senate Minority Leader Chuck Schumer, Speaker of the House Paul Ryan, House Majority Leader Kevin McCarthy, and House Minority Leader Nancy Pelosi drive nails into the inaugural platform on September 21, 2016. Members of Congress reached a deal late on Sunday that will keep the government funded through September. The Trump administration had floated adding a number of controversial provisions that Democrats said could spark a government shutdown, such as money for a southern border wall, defunding Planned Parenthood, and punishing “sanctuary cities.” The bipartisan deal includes another $1.5 billion for border security and $12.5 billion in new military spending, but the Trump administration dropped all of these “poison pill” demands. Democrats had also threatened to shutdown the government if Republicans held a vote on Obamacare repeal, but last Thursday GOP leaders said they didn’t have the votes to revive zombie Trumpcare. With hours to go before the midnight-Friday deadline, Congress passed a stop-gap funding bill that gave them another week to negotiate. Both chambers are expected to vote this week on the longer-term spending bill. • $15 billion in military funding. This is a win for Republicans, though Trump had requested $30 billion in additional military funding in his budget blueprint. According to Bloomberg, $2.5 billion of the funding is contingent on the Trump administration providing a new plan to fight ISIS. • $1.5 billion for border security, such as additional detention beds and repairing existing fencing. The money can’t go to funding a border wall or hiring ICE agents. • $2 billion in additional funding for the National Institutes of Health, bringing its funding to $34 billion total. • $68 million to reimburse local law enforcement for the cost of protecting President Trump when he visits his residences in New York and Florida. • The Environmental Protection Agency will keep 99 percent of its funding, and there are funding increases for clean energy and science. Trump had proposed funding cuts for all three. • $1.3 billion to permanently extend health-care benefits for 22,000 retired coal miners. • $2 billion in disaster funding for California, West Virginia, Louisiana, and North Carolina, and more money for transit infrastructure grants. • $407 million for wildfire funding to western states, and a 2 percent increase in funding for national parks. • $100 million to combat opioid abuse. • $295 million to help Puerto Rico keep making payments to Medicaid. Last week President Trump complained via Twitter that Democrats were threatening to shut down the government if “we don’t bail out Puerto Rico,” though Puerto Ricans are tax-paying American citizens. The bill doesn’t defund Planned Parenthood or sanctuary cities, and Democratic leaders said they forced Republicans to withdraw more than 160 riders. Congress was originally supposed to have the funding for the 2017 fiscal year settled by last October. Even if the deal passes easily this week we’re in for more budget drama next fall, when Congress faces another government shutdown and a vote on raising the debt ceiling.